To say that Gor Mahia has had a successful 2015 season would be an understatement. It is especially impressive considering that in 2014, Gor Mahia lost a whole host of players who had been the backbone of the team. Dan Sserunkuma, Geoffrey Kizito, Rama Salim, Edwin Lavatsa, Paul Kiongera, Shaban Kenga, Timonah Wanyonyi, Anthony Akumu and Kevin Omondi among many others left at various points during the season. To make matters worse, coach Bobby Williamson also left in August. 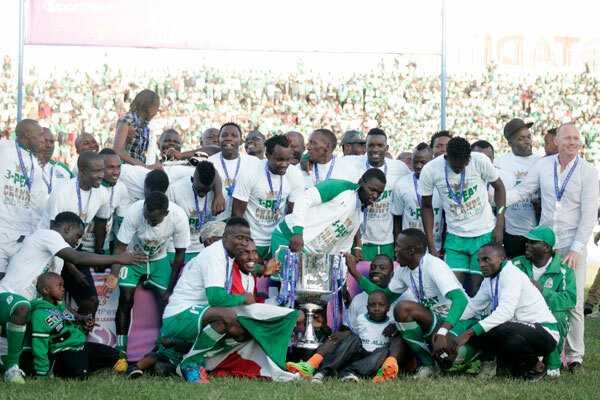 However with decent planning and recruiting, Gor Mahia recovered and had what can only be described as a spectacular season, perhaps second only to 1987 when Gor Mahia won the Africa cup winners cup, the league and the Moi Golden cup (now known as GoTV shield). As things stand now, the season is coming to an end. Once again many players are set to leave. The contract of Geoffrey Walusimbi who has played a pivotal role over the past two seasons is coming to an end. Walusimbi has been instrumental with his all round intelligent play, tactical awareness and brilliant passes near the penalty box that often result in goals. Meddie Kagere whose goals have been instrumental and who has given fans plenty to remember, also has a contract that is coming to an end. Another key player whose contract is ending is George Odhiambo “Blackberry”. “My contract ends out and I am not very certain I will still be in Gor next season. There are a number of offers which have come from Europe and I will look at all of them and see what is good for me and make a decision,” he told Soka. Gor Mahia has had a formidable unit in 2015 . If the core of this team is kept together for 2016, they could reach even greater heights. Now Kenyan team has reached the second round of the African champions league. Gor Mahia could be the first. With a bit of luck in the draw, they could even reach the group stage. In 2015, Gor Mahia lost narrowly to AC Leopards yet they were forced to play without key players like Kagere, Nizigiyimana and Sibomana. Perhaps even more important is to keep the services of coach Frank Nuttall whose tactical brilliance surpasses any coach in Gor Mahia’s history. Gor Mahia will need to work overtime to keep the core of the team together and also to recruit players who are capable of stepping into the breach and effectively replacing the players who are set to leave. To keep the core of the team intact will require a lot of planning on the part of the officials. Once again all the financial initiatives that were initiated to keep the club financially moribund have seemingly fallen by the wayside. The SACCO, the #35010 paybill number, the membership drives, Gor Mahia bread etc, are no longer being promoted much as this columnist predicted in July. The chairman will need to bring these initiatives back to the forefront. Ambrose Rachier performed well in his capacity as club chairman in 2015. We hope that his campaign for the FKF chairmanship will not distract him from the planning that the club needs for 2016. Do they ever read this stuff you write here? Or its just like throwing flowers over the dead body? No they dont read this page…..too busy doing some other stuff only to rush in late in February next year. Quote Logarusevic who said that Gor won the cup and went to sleep. I know the Gor Mahia Sacco Is working. It’s not even a year since it was launched. 17th May 2015. It’s lending already to its members. It will grow to own Gor Mahia FC and Finance it. Have you joined ? Or just commenting from outside. Some of us believe this is our journey to financial freedom for the club. At 100 Kenya shillings annually to the club we need only 1 million like minded Fans. @ BILL ONYANGO, I HAVE BEEN LOOKING FOR THIS FORMS IN NAIVASHA HERE BUT I CAN’T GET THEM? CAN SOMEBODY E-MAIL THEM FOR ME ON THIS E-MAIL ADDRESS ” henry@oceanagea.com” PLEASE I CAN PAY FOR ONE YEAR IN ADVANCE, FOR THE SHAKE OF K’OGALO GOR MAHIA, NYAM NYAM NYAMO TIMBEE!! This is a brilliant piece. It reveals one thing that you have the running of this club in your heart. I can only strengthen this piece by saying that based on the immediate achievements that we have, I think the EC is at work. Probably they are even ahead. As it stands, during the year they implicated and it is a fact that the club has proven its mantle on the local seen. This can only mean that they are thinking a head to make an impact in the region and on the Continent. To achieve these goals you can rest assured that the spanners are on the works. We may or will loose some players but at the same time we will recruit some players. Under the Chairmanship of Mr. Ambrose, they have shown us what it is that is good planning. Now I am not in way saying they have done 100 percent, but they have done well. However, I also wold like to say that they must not celebrate forever lest the new season find us napping. The scouts must continue the such, Financial issues must be part of our priority especially sponsorship. But should it come to the point of staring the league again without sponsorship, then the Gor Mahia family must go an extra mile to recruit and maintain the support base. This we can do by avoiding negative things that for along time have been associated with us. With the pomp that we display, guided properly we can increase the support base. Let us make it a family day out. Guys we can do it. Recently someone insinuated that Gor is a Luo thing, these are the type of guys that we must work to attract and how do we do it, Discipline, Availability, Accountability(both in the office and at the entrance) and Faithfulness. Otherwise let us keep the bar higher since we have raised it. Coz they start with votes in their pockets .rachier 16clubs votes kpl. Nyamweya 18clubs votes fkf . So nick mwendwa might take 4votes from nyamweya fkf clubs n nyamweya take 2vote from rachiel kpl clubs. So rachier needs only 17 votes from branches delegate to win Fkf election with a total of 31votes n surely rachier is destined to win. Ve looked at the current gormahia EC n ve not seen even one member who is able to run gormahia that’s why their is panick among players .let face reality rachier is leaving gormahia courtesy of winning Fkf n we need to start thinking about Bringing SAmmy shollei On board coz rachier might hire Dan shikanda in fkf secretariat. I think we should not be worried about Rachier and Gor. If AR gets the top post then the likelihood of sponsors coming into the league is real. And in that the biggest beneficiary will be Gor and Ingwe to a lesser extent. These are very objective pieces written here. I am for once very happy reading such articles on Kogalo’s page. my plea is to all fans, please let’s be objective in our support of the team and let’s create one huge Kogalo family. The nay sayers thought we’d be dead by now. The optimists like AR, Bobby Ogolla, Bobby Williamson, Nuttall and team believed there’s life in Kogalo. I say let’s live fully and let’s stand tall. DO SOME OF US BLOGERS READ THE NEWS PAPERS, I DIDN’T SEE THE NAME OF DR. AR, WHEN THE POLL OPINION WAS CONDACTED. GOR SEMELANGO HAD 38%, FOLLOWED BY NICK MWENDWA 34%, THE REST HAD BELOW 2%. TO ME I DO THINK DR. AR SHOULD CONCENTRATE ON GOR MAHIA K’OGALO, COME NEXT YEAR WE GIVE HIM ONE CONSTITUANCY IN NAIROBI. I THINK THAT’S THE BEST REWARD WE CAN GIVE HIM, FOR THE HARD WORK HE HAS DONE AT K’OGALO NYAM NYAM NYAMO TIMBE!!! WELL DONE DR. AR!